Check out what's coming up next and... see you on the boat! This is a day time event targeted at families and mature guests, who prefer a more relaxed atmosphere. The theme of this event is ‘Pirates’. We will create a never before seen atmosphere filled with animation and entertainment for the guests. Guests are welcomed on board by our animation team and staff who are all in pirate dress as characters from the movie "Pirates of the Caribbean". Every bus will have a big signboard with the name of the event. Thus any mistake will be avoided. Guests come on board from the passenger terminal at the harbour of Nessebar..
Each of them will receive a bandana and a stick on tattoo “Tattoo" and will be named with a pirate name. Children on board will enjoy special attention provided by a face painter who paints them like different characters. And, throughout the day there will be various competitions with many prizes and they will also be taught how to read maps, so to find any hidden treasures, learn how to make knots and how to catch fish, etc. Again for the children we have organized a special guest magician, whose program will be in the context of the pirate theme. Those guests who prefer the laid back atmosphere we provide the third deck available. Here they get a real comfort and relaxation. While our animators entertain the guests, the slide and pool will become available under the watchful eyes of our 6 lifeguards, there is also a lifeboat constantly orbiting the boat and is ready to render assistance to anyone who needs it. The slide and pool will be in use for 1 and a half hours. - Vegetables: carrots, cucumbers, cabbage, tomatoes accompanied by a pate of Mediterranean hummus. - Fruits: watermelon, bananas, apples, oranges. During the event the guests are provided with beer, sangria, soft drinks from the post mix and mineral water from the cooling dispenser. Beer and sangria are available after the stop for swimming. During the lunch tables and chairs are arranged on first deck, the atmosphere is calm and the music is quiet. First child 2-12 years: 32 lv. 2, 3, 4 .... child 2-12 years: 20 lv. The name of this event makes it clear, that the target here are the young people. 13:00hrs: Guests have to be at meeting point - Hollister. Hollister Bar is located on the Flower Street and it is very easy to be found. 13.30 hrs: Transportation to Tattoo is provided by buses by our animators. 14:00 hrs : Tattoo leaves Nessebar Harbour . During this party the crew, bar staff and entertainers are dressed with stylized sailor uniforms. Everyone receives a bandana and a stamp with tattoo “Tattoo”. This event includes also time for swimming and using the water slide. Our animation team set the mood, accompanied by DJ Kai. This is our resident DJ, who boasts a rich CV and is extremely diverse, playing in Magaluf, El Arenal, Ibiza, Rhodes, Dresden, Amsterdam, Love parade - Berlin and others. A distinctive feature is his wide range of music, from R’n’B, Old school, Drum and base, German party and commercial house. This ensures that all tastes will be satisfied. The main idea of this party is to create a slightly "naughty" atmosphere. Our animation team organizes several games so that each person to be an active participant rather than a passive observer. For those who prefer relaxed atmosphere the third deck is available. - Burger / Vegetable burger for vegetarian /. Drinks, that are unlimited throughout the event, are: beer, sangria, soft drinks and mineral water from cooling dispenser. Sangria and beer are available after the stop for swimming. Also the bars offer full range of drinks that can be offered in a club. From cocktails and mixes up, and the prices of course are preferred. 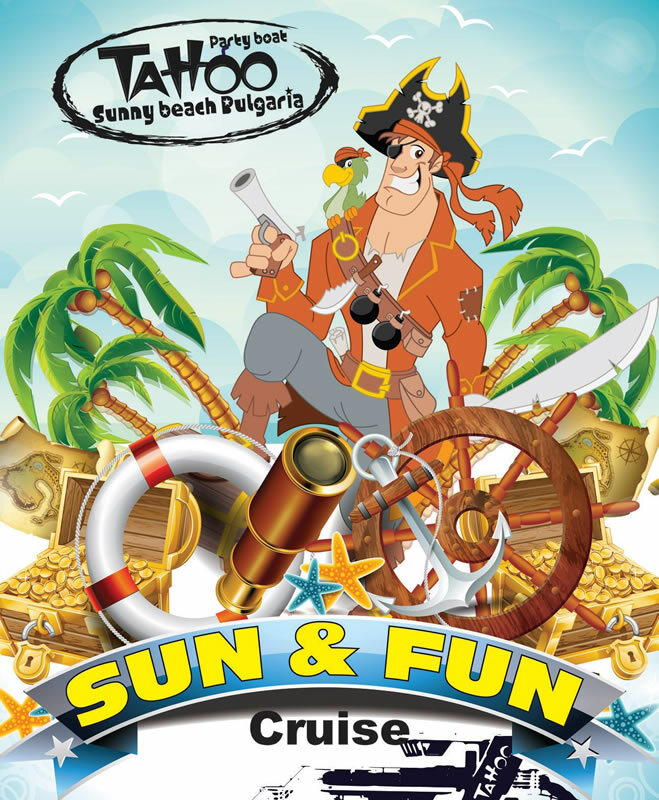 "Tattoo party boat" sails back at 18.00h to the harbour of Nessebar. Tourists will be transferred from there by busses to Sunny beach. 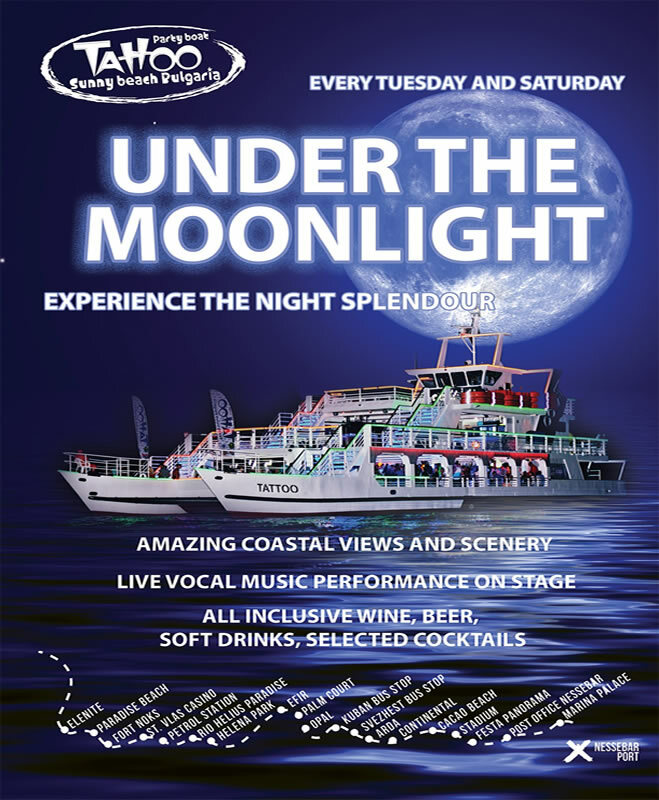 “UNDER THE MOONLIGHT” is a unique evening excursion. You will be immersed in a romantic journey under the moonlight, crossing the red carpet with a glass of Champaign in hand. Moonlight Cruise – On Tattoo – Tuesday’s. Summer 2017 welcomes a brand new event on the largest boat “Tattoo” on the Black Sea. © Copyright 2017 Tattoo Party Boat | All Rights Reserved.